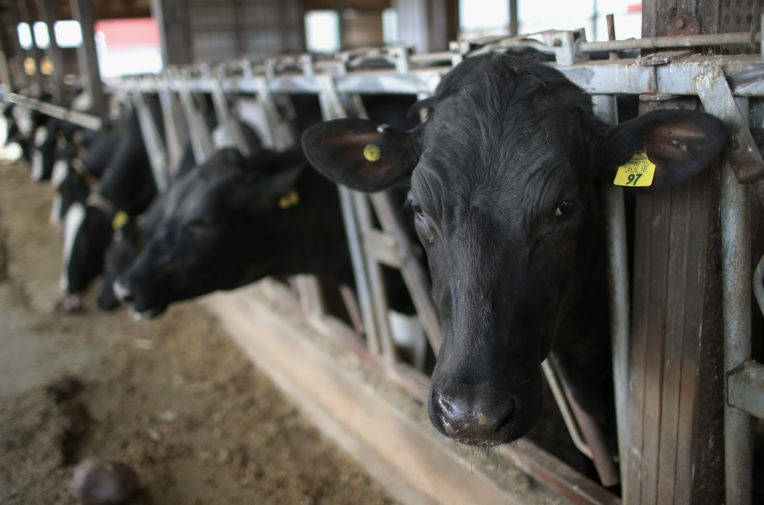 The UK could face pressure to significantly weaken regulations that prevent milk from cows with infected udders reaching consumers, under a post-Brexit trade deal with the United States. US rules allow almost double the amount of somatic cells – white blood cells that fight bacterial infection – than is permitted in UK milk. Milk with a high number of blood cells is of much lower quality and nutritional value. High cell counts can also indicate poor animal welfare on farms. US regulators oppose the EU’s stricter limit and also its requirement to test milk at farm level – a measure designed to single out farms with infected herds – preferring to test vats of milk further down the supply chain that come from a number of producers. Unearthed can reveal that the US dairy industry is already in discussions with the Trump administration about a trade deal and would like to see the UK relax its standards relating to somatic cells once it leaves the EU. This could see imports of US cheese, milk powders and other dairy products produced to less rigorous standards than currently permitted in Europe being sold in the UK. Milk with a high cell count goes rancid more quickly and is less nutritious – containing low levels of butterfat, milk protein and calcium, and relatively high levels of sodium and chloride. It is also used as an indicator of bovine mastitis – a painful condition that causes a cow’s body to send white blood cells to the infected udder to combat the bacteria – and is therefore used to monitor animal welfare. In advanced infections the somatic cells may build up with dead bacteria and tissue to form pus around the infected udders – however, cows must be taken out of production if these symptoms are spotted. The news is the latest in a series of controversies over the threat of weak US food and environmental standards – such as the use of growth hormones and washing chicken in chlorine – being exported to the UK as part of a post-Brexit trade deal. Shadow environment secretary, Sue Hayman MP, told Unearthed: “This investigation shows that animal welfare standards are under threat after Brexit unless the Government are unanimous and clear in upholding and enhancing animal welfare standards from the outset. Somatic cells are naturally present in milk in low concentrations, but levels above 200,000 cells per millilitre (mL) indicate that cows’ udders are likely to be infected – usually with bovine mastitis. Milk from cows with bovine mastitis contains a different kind of white blood cell to normal milk – 90% of somatic cells in milk from infected udders are neutrophils – which fight infection and are the major constituent of pus. In Europe, milk with a somatic cell count of more than 400,000 cells per mL is deemed unfit for human consumption. But the US standard is almost double, at 750,000, reportedly the highest of any developed dairy producing country in the world. “The US standard has always been considered non-protective because it allows for a large number of cows with mastitis”, she added. A 2013 paper – published a year after the European standards took effect – said they had led to more focused efforts to tackle mastitis than in countries, like the US, that have a higher limit. But the US trade department – at the request of the dairy industry – has included the EU regulations on a hit list of trade barriers that it wants reduced or eliminated. “Our dairy farmers are recognised the world over for their high-quality produce. Dairy farming is worth £3.3 billion to the UK economy and is vital to our countryside. Therefore any future deal must work for UK farmers, businesses and consumers,” she continued. Shawna Morris, the vice president for trade policy at the US Milk Producers Federation and US Dairy Export Council told Unearthed that discussions with the Trump administration over a trade deal with the UK have already begun. “It’s something that we’re talking with the US administration about, yes, although I’d say certainly by far a lot more focus in the US is on the US negotiations with our NAFTA partners, but looking down the road to new agreements it’s part of our trade policy discussions and portfolio with the US administration”, she said. She confirmed that US dairy producers had concerns around “both” the level of permitted somatic cell count and the EU’s requirement to test individual farms – but claimed US exports could meet EU regulations depending on “how you’re defining what compliance is”. A key complaint of the US dairy industry is that the EU requires milk to be tested at farm level, rather than testing vats of milk further down the supply chain that come from a number of farms. Morris claimed exported milk could meet EU standards but she opposed ensuring regulations were met at farms. Academic studies show that with cell counts at higher levels milk quality is greatly reduced – resulting in low levels of butterfat, milk protein, calcium and relatively high levels of sodium and chloride. This means milk with a shorter shelf life and lower quality cheese. Royal Veterinary College lecturer Peter Plate told Unearthed: “The 400,000 limit is a sign of quality of the milk. At the end of the day these cells we are talking about, if raised in numbers, are cells that are generated during inflammation”. “They’re immune cells,” he added. As Morris made clear, a major gripe of the US dairy industry is that EU cell count limits have to be tested and met at individual farms, rather than in large vats of milk from multiple herds. But testing at farm level enables the European Union to regulate animal welfare in foreign farms, and to ensure milk from infected cattle does not enter the food chain. The EU opposes so-called “environmental dumping”, whereby exporters could flood European markets with goods that have been produced more cheaply due to lower environmental standards. Plate told Unearthed that clinical mastitis is a painful condition that decreases a cow’s pain threshold for other conditions. He added that factors such as cramped conditions can be to blame for high cell counts. The US agricultural sector has a history of opposition to EU regulations on food safety and animal welfare and the Trump administration looks set to continue that approach. Last year Unearthed revealed that President Trump’s top agricultural trade negotiators – Greg Doud and Ted McKinney – previously held roles lobbying for the use of livestock growth hormones and opposed EU restrictions on such products. In January, McKinney said he was “sick and tired” of hearing British concerns about chlorinated chicken and US food standards. Doud, who is the United States’ chief agricultural negotiator, authored a paper in 2013 arguing that the US had “better be” willing to walk away from trade talks with the EU if it refused to drop restrictions on US agricultural produce, such as hormone-reared meat. The US government has previously described EU limits on somatic cell count as “burdensome for U.S. exporters” because they are stricter than the US standard. According to its most recent hit list of trade barriers, somatic cell count is not a food safety issue, but rather “a measure of milk quality and an indicator of overall udder health”.